These historic photographs are from the archived collection in the Heritage Centre, Coalburn. They formed part of a series of booklets prepared by Jim Hamilton for the Lesmahagow Parish Historical Association in 1993. The modern photographs in 2017 are by David Halls. 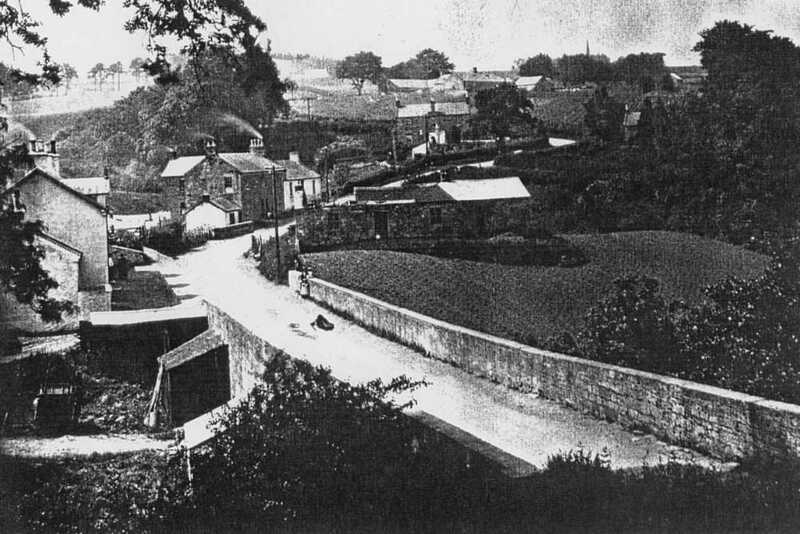 View of Burnfoot across the bridge over the River Nethan. The date of the photo is not given but it has to be before 1927. The flood in 1927 destroyed the bridges (see below) and the Nethan Bridge was rebuilt without the buttresses shown in this image. A similar view in December 2017. The house between the two bridges remains, but the building beyond the second bridge has gone. 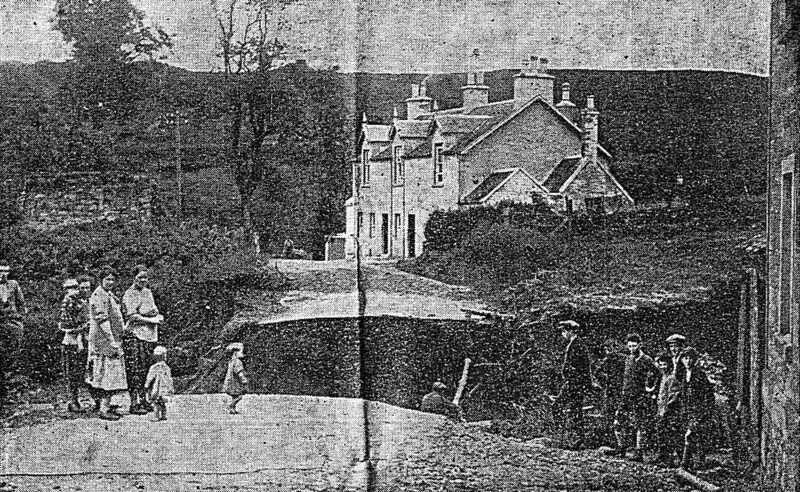 A photograph from a national newspaper showing the damage to the bridges over the Birkwood Burn and River Nethan at Burnfoot after the cloudburst in Lesmahagow Parish in 1927 which caused flooding. The same angle in December 2017. The nearest bridge is over the Birkwood Burn which must be the chasm seen in the previous photo, The other bridge (River Nethan) was also badly damaged but the extent is not apparent in the previous photo. The Birkwood Burn (shown here in Dec. 2017) has normally just a modest flow, so it must have been some torrent to destroy that bridge. The fields near the Nethan were used for fruit growing. 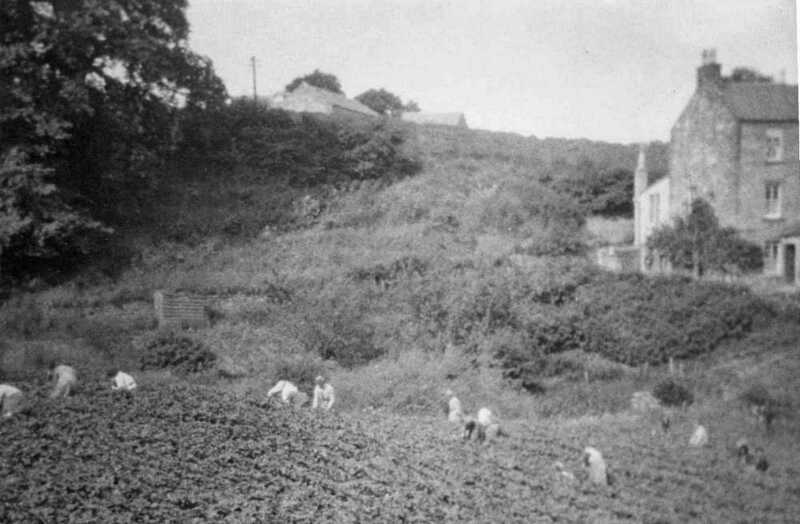 Extensive strawberry fields at Burnfoot before disease struck in the 1920s. Workers can be seen pulling the berries (poor quality image). Gooseberry bushes. 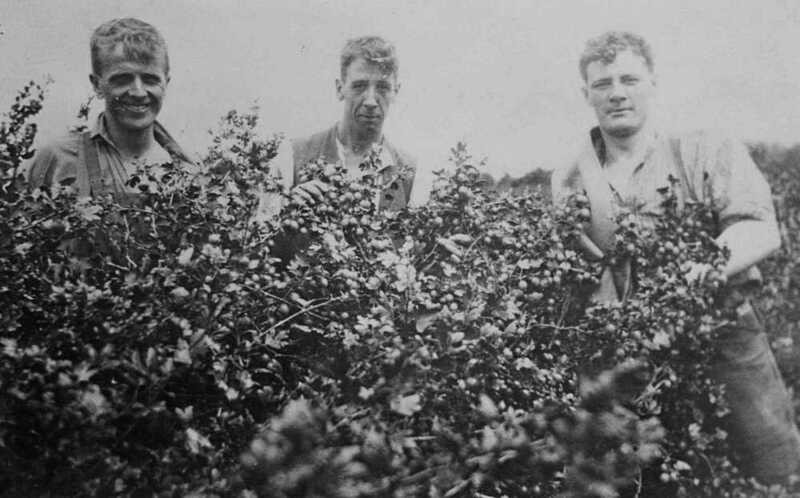 The workers pulling the berries are (left to right) John Clelland, Tommy Simpson and Bob Frew. Other buildings in the hamlet. The other buildings were on the hill going down to the bridges. Lochanbank Cottage, Dec 2017. At one time, there was a sweetie shop in one of the rooms. The old house on the bend (Dec 2017 then undergoing repairs). This house was notable in that the flats in it were reached from three different levels without stairs as the house was located on a sharp bend on a hillside. 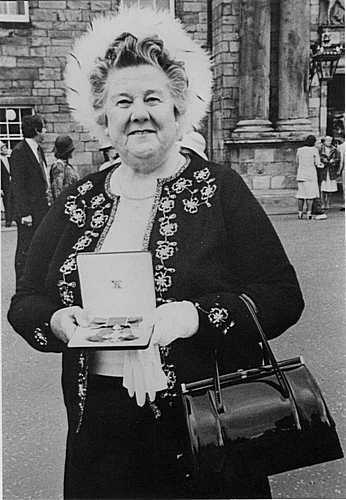 The Clellands were an important family in Burnfoot. Tam Clelland, a fruit grower, lived with his wife, daughter and two sons on the middle floor of the house above. Two of his children taught at Lesmahagow High School - Wull ("Chief") taught science whereas the daughter, Nancy, taught maths. It was Nancy ("Wee Nancy") who achieved the most fame and notoriety as a teacher. She was regarded as a good teacher but had a bit of a reputation as a tyrant. She had a sharp tongue and could invoke fear in some of her pupils. She was not averse to using a belt on pupils if necessary. She lived in that house all her life until later she had to move into Waterside Residential Care Home, where she was seen as good fun and loved by her carers some of whom had been taught by her. Prepared: 01 March 2018 DJH. 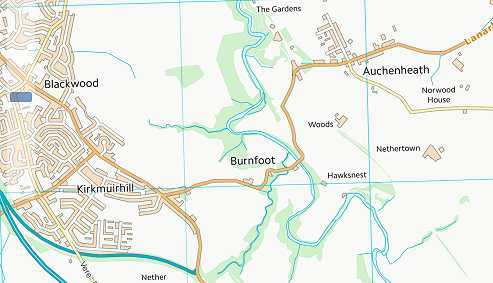 I would like to thank all the people who put comments on the Lesmahagow Facebook page which enabled me to understand better the history of Burnfoot and Nancy Clelland. A special thanks to Nan Kirk.